That may sound ambitious, especially since only about 10,000 such asteroids have been catalogued to date. But the Sentinel space telescope, which is slated to launch into orbit around the sun in five years or so, can deliver the goods, according to its mission team. "We'll find about a half a million," said former NASA astronaut Ed Lu, chairman and CEO of the nonprofit B612 Foundation, the group behind the Sentinel project. "This is going to be the definitive map of the inner solar system." Sentinel's predicted productivity stems chiefly from its location. The B612 Foundation — which takes its name from the asteroid home of the title character in Antoine de Saint-Exupery's beloved novella "The Little Prince" — plans to place the telescope near Venus' orbit, substantially interior to the path Earth takes around the sun. Sentinel will look outward from there, scanning Earth's neighborhood without having to fight the sun's overwhelming glare — a serious impediment to asteroid-hunting instruments on or near our planet. "The vantage point makes all the difference," Lu told SPACE.com. 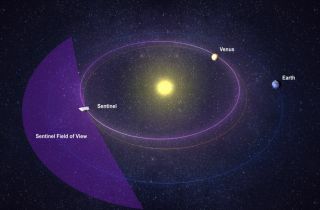 Sentinel will search in infrared wavelengths, in which asteroids stand out as warm, moving blobs against a relatively cold and static background. The telescope's mirror will be 20 inches (50 centimeters) wide, B612 officials said. In its 5 1/2-year prime mission, Sentinel should find the few remaining mountain-size near-Earth asteroids that scientists have not yet spotted — space rocks at least 0.6 miles (1 kilometer) wide, which are capable of doing damage on a global scale if they smash into us. And the telescope will likely identify about 90 percent of nearby asteroids at least 460 feet (140 meters) across, Lu said. Space rocks of this size could obliterate an entire state, scientists say. The B612 Foundation wants to identify potentially hazardous asteroids years or decades before they may hit us, giving humanity enough lead time to mount a deflection mission. But Sentinel is not all about doom and gloom. The mission team also hopes its asteroid census will serve as a resource for groups who wish to visit space rocks for scientific, exploration or economic purposes. The Foundation has already completed preliminary designs for the mission and the spacecraft, and it hopes to begin construction of the telescope in early 2013, Lu said. (Ball Aerospace, which also helped develop NASA's Kepler and Spitzer space telescopes, will build Sentinel.) The organization aims to launch Sentinel aboard a SpaceX Falcon 9 rocket in 2017 or 2018. Mission costs aren't finalized, but Lu said Sentinel's price tag will likely end up being a few hundred million dollars. The B612 Foundation hopes to pay for it with contributions large and small from around the world. "We're an international project," Lu said. "I think this is a chance for people worldwide to feel ownership of this telescope, and of the concept that we can protect our planet."